You had information over load when you went to other review sites. It is frustrating sometimes when you just want a list of products and some information about them, but instead you have people telling you how to use the product and in what order, what is the best time of day, the dangers and blah blah blah. Yes all of that information is important but its not what I need at the minute, to be honest all the user instructions come with any whitening system you purchase. No need to explain it in the product reviews when its not what people want. For any whitening treatment to work fast and effectively it needs to contain either Hydrogen peroxide or Carbamide Peroxide because these active agents can get down and remove the deep stains on your tooth. But you need make sure that the whitening strips have the optimum concentration levels of these ingredients! The concentration levels needed for effective whitening are 10% hydrogen peroxide or 35% carbamide peroxide. Going any higher than these levels unsupervised is dangerous and might cause other problems such as extreme tooth sensitivity. The chemicals also have the potential to corrode the mucous membranes or skin, and can cause a burning sensation and tissue damage. Only dental professionals should be administering anything more powerful! The best thing to do is get advice from your local dentist and see what options are available and which ones will benefit you and what to avoid! It’s no good buying a whitening product and using it with no real results to show for it. Obviously there are a wide variety of whitening products and they all have their optimum whitening results. Some kits will give you pearly whites in a few days while other may take weeks. But you also have to factor in how long the results will last. Quite often is the case that the treatment that takes longer to give results tends to last much longer than whitening strips which give instant results but tend to fade away after a couple of days or a week. The single best method to see which company produces the best results is a simple customer review analysis. You can go to Amazon and at the bottom of the product page you will see the average rating and what people are saying about it. General rule of thumb is, if its 3.5+ stars its worth looking into more detail. Getting good results with whitening strips depends on whether you use it consistently. 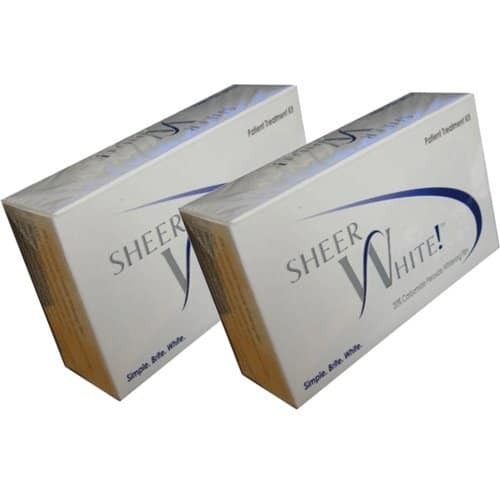 Most whitening systems recommend you use the whitening strips twice per day for maximum effect. If you can get 5-10 minutes of your day solely focusing on tooth whitening then you should have no problem using this method of treatment. They also need to be comfortable to use because let’s be honest, no matter how effective something is at removing stains, if it causes too much discomfort then it won’t get used at all. There needs to be an equilibrium between ease and comfort. Now that you know the things to look out for when choosing your whitening strips, lets get into the actual products themselves. The list is no particular order as we believe all products listed will give you results! Why pay for professional tooth whitening when you have Crest 3D? they are just as effective! The strips supposedly give you results that last for up to 12 months but if your a heavy tea/coffee drinker you will probably need to re use this treatment every 6 months to keep the tooth white. The advanced seal system is unique to this brand making sure that the strips don’t slip or slide off giving you maximum effect. The company itself is one of the big players when it comes to any sort of whitening products and we have looked at all the reviews left by customers from various sources and 95% were blown away by the effectiveness of the strips. There were a couple of picture reviews left and you can clearly see the astonishing change they underwent in under a week. It’s recommended you only use these whitening strips once per day for 30 minutes. All you do is peel back the strips and stretch them slightly so they can fit over your tooth. Leave them on for 30 minutes and then take them off. Do this for 1 week straight and you will see drastic changes for sure! This brand is not well-known in the tooth whitening space but don’t be fooled, They have the potential to give you proper results! The brand is actually owned by Amazon and you can be sure that a lot of money has been invested in producing this whitening system. It’s not as extravagantly packaged as crest 3D but that doesn’t matter too much because it uses similar technology and mechanisms to help give you a white smile in 14 days. The strips are safe and will not damage enamel and have been created to stick to the tooth for 30 minutes which is the optimum time to help gently whiten the tooth. 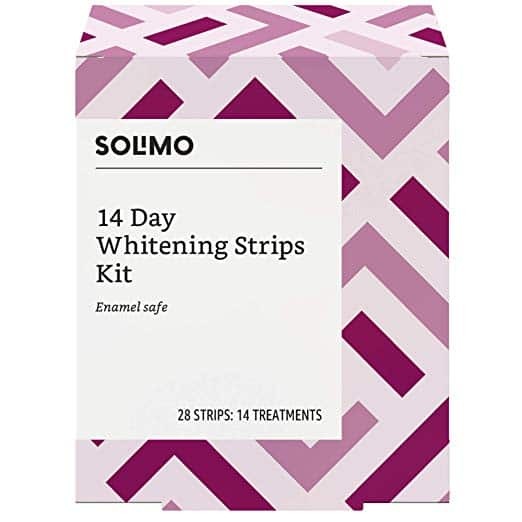 The pack contains 28 strips, 14 for the bottom set and 14 for the top set, so you will have enough for 14 days which is the usual time frame to see drastic changes. A thing to note is this treatment will only whiten natural tooth, if you have caps, crowns, veneers, fillings or dentures then you might want to consider another treatment option entirely. It’s very simple, all you do is take out the strips and attach one set to the upper jaw and one set to your bottom jaw. Once they are on firmly, leave them for 30 minutes so the ingredients can get to work. Using it once per day for 14 days should give you drastic improvements. But if for some reason you are not satisfied with the product, you always have the option to ask for a refund. Just make sure its within 30 days and best of all you can keep the product to yourself. 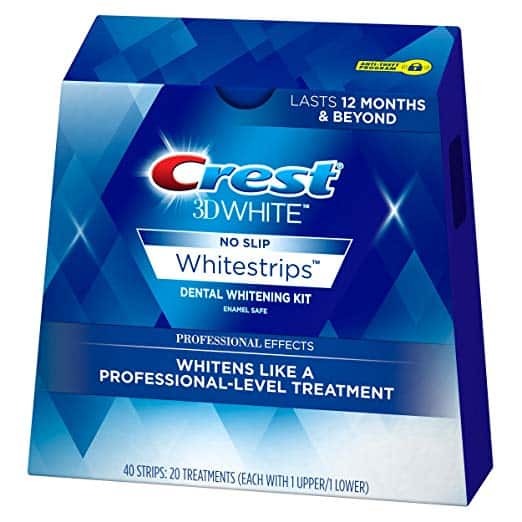 These whitening strips are much cheaper than crest 3D and if your someone who is new to the whitening game, it is a good stepping stone to start experimenting with. 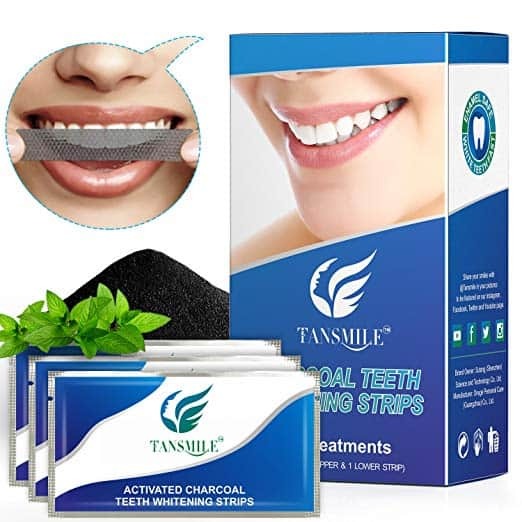 These strips are slightly different from the standard ones you see all over the internet and this is because they use the active ingredient: Bamboo charcoal powder instead of peroxide. 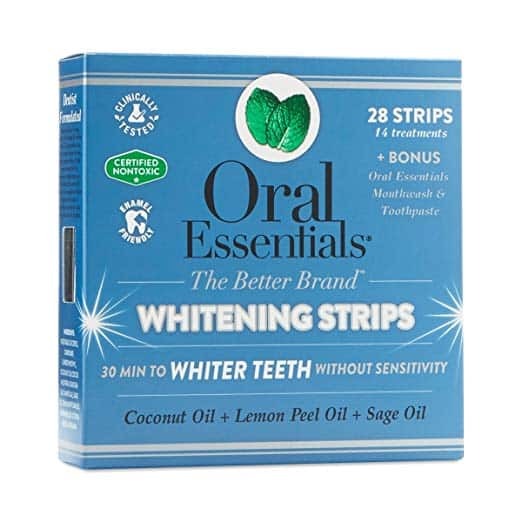 If your someone who has extreme sensitivity or have a few gum issues then investing in these whitening strips might be the best option because no harmful ingredients are used and the potential side effects will decrease significantly because of this. The tansmile whitening system comes as a 14-day treatment plan and you only have to use them for 30 minutes each day. This is enough time for you to see major changes in the colour of your tooth. The ease at which you can apply them makes it a lot easier than other whitening methods especially dental whitening which as you know is very expensive and complicated. However, because its not one of the major tooth whitening brands out there, not many reviews are left by customers but the few who have tried it said they noticed a definite change in the complexion of their tooth and to also use them at nighttime before bed for Best Results! Looking in a mirror, fit the lower strip by applying the sticky gel side against your tooth. Line up with the edge of the gum and apply gentle pressure to mold the strip securely to your tooth. Fold remaining strip behind tooth to keep in place. After 30 minutes, peel off the strips and brush your tooth. Brushing your tooth afterwards is important because this is a charcoal based treatment which means there will be some black pieces left in your tooth. Brushing them will easily remove this problem. This is a great option if you like the natural way of fixing things and the price isn’t too expensive either. You should really consider this! 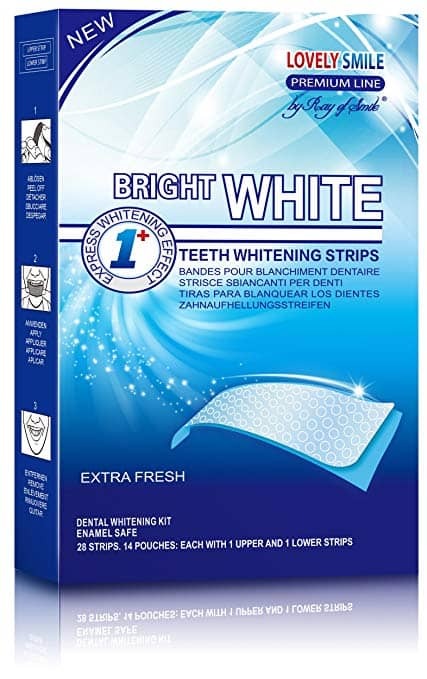 Produced by the manufacturers: Ray Of Smile, these whitening strips have been in the game for years and with more than 1 Million satisfied customers you can see why its made it onto this list. The simple matter of fact is: They Work! One of the biggest advantages this has over other whitening strips is the adhesive that is used to help make them stick to your tooth. Customers have unanimously said that these stay attached to tooth longer than any other product which is probably a good thing, why? Well because this company recommends you use the strips for 60 minutes per day instead of the industry standard 30 minutes. The No-Slip technology is probably one of the best out of all the whitening strips on the market and best of all you can drink, talk, shower, or even jog and do other sports activities while using these. Another cool aspect is the shade guide that comes with the product so you can track your progress and once you have reached your desired colour you can stop and admire your tooth for the next 6-12 months before you will have to reapply the product. It’s really easy because all you have to do is remove the whitening strips from the packaging and remove the backing film. Then carefully attach to the lower tooth first making sure they are stretched all the way over the entire surface of each tooth. Do the same for the upper tooth and you are good to go. Wait 60 minutes and then carefully remove the strips. Sometimes you might have to remove small pieces at a time because the adhesive is so strong it won’t be possible to remove the whole thing in one go. There are enough strips for a 14-day treatment and by the end of it you will come out feeling like you have a new set of tooth. Still don’t believe me? Go and look at the before and after pictures left by real customers. Dental duty is an established brand but when it comes to tooth whitening strips, its a little baby. That doesn’t mean its bad, all we are saying is its a relatively new sector they are getting into. There aren’t that many reviews for this because its not an established product, but it has had 5 star reviews left and is Amazons choice which means there is some substance to it. 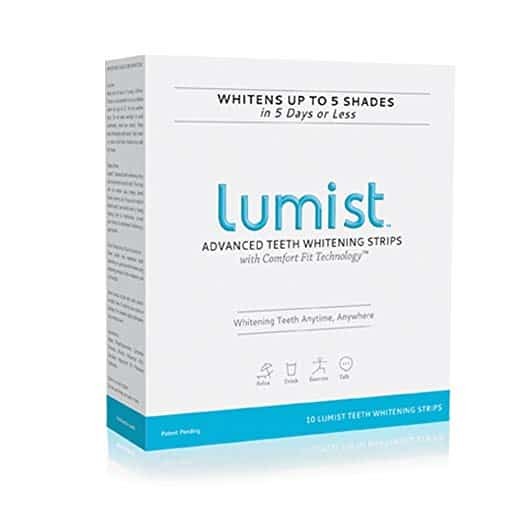 There aren’t any special features that distinguish this from the rest of the whitening products, the only thing we can think of is the fact they say you can use the LED tooth whitening light with these strips for faster professional results! One of the biggest positives is the price, It’s only going to cost you $10.00 which is nothing when compared to some other brands. If its your first time looking for this type of whitening treatment then by all means go for it because you will get a feeling of how it actually works and if you mess things up (Hard To Do) you won’t feel ripped off. Tear open foil packet, then remove the whitening strip with dry hands and peel away from backing film. After 30-60 minutes, peel off the strip and reveal your whiter tooth, repeat the entire process once a day for 14 days. Sonimart may not be well-known as some other big brands but let me tell you, they get the job done and do it very well! 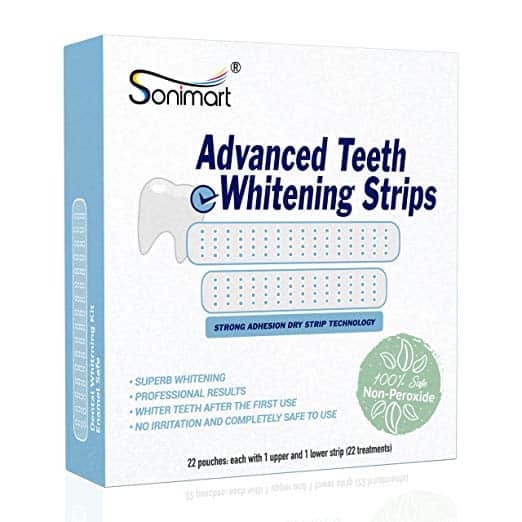 These non peroxide based strips use the latest technology which enables them to stick to your tooth comfortably and provide easy yet effective tooth whitening. It has a rating of 4.3 out of 5 making it a trustworthy product. The reviews also give you the confidence to invest in these whitening strips. So far all other products only come with a 14-day treatment plan but that’s where Sonimart differs. It comes with 44 strips meaning you will get enough for 22 treatments. That’s more than enough to help you get the smile you deserve. We mentioned earlier that this does not contain peroxide, instead it uses a unique oxygen activation formula to help lighten your tooth. It’s perfect if your someone who suffers from tooth sensitivity. The strips themselves use a strong adhesion formula guaranteeing they will not slide off your tooth no matter what! You are provided with strips of different lengths. The longer strip is for your upper mouth whilst the shorter strip is for your lower set of tooth. If you want to achieve great results with this product, we suggest you use it for 14 days straight and then evaluate your results. If you haven’t got the results keep using it until it finishes and by the end of it you will see definite results. Lumist whitening system is different from other systems because it only contains 5 days worth of strips but the reason for that is the high concentration of the active ingredient: Carbamide Peroxide, 20% to be exact. The packaging and how its been made give it that high end feel and the price reflects this. Currently its on the market for $39.99 which makes it one of more expensive products out of this list. It must have some excellent features to warrant such a price? One of the selling features is the comfort fit technology they have incorporated and what this means is your tooth will have that extra comfort and stability during the time you are wearing them. The patent pending formula enables the strips to remove tooth stains gently and give you results in just 5 Days!, Sound pretty Amazing. 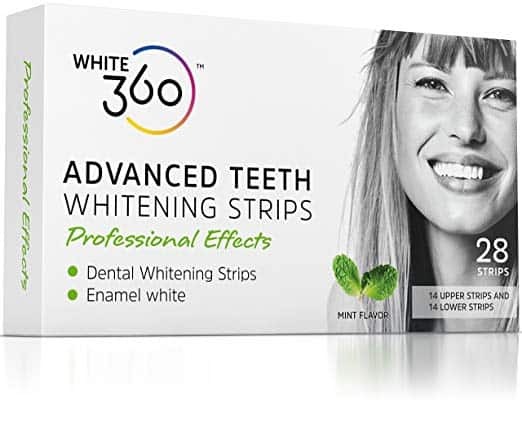 Some strips can feel weird and stop you from carrying out normal tasks but with this specially formulated product, you can enjoy a drink, exercise and can even talk normally whilst wearing them on your tooth. The only problem will be remembering to take them off after 30 minutes because that’s how comfortable they are. The only thing to consider is how sensitive your tooth are because this has a relatively high concentration of Carbamide peroxide which may cause some irritation but luckily this doesn’t last. It usually goes away after a few hours. For best results please complete the treatment in 5 days without skipping a day. 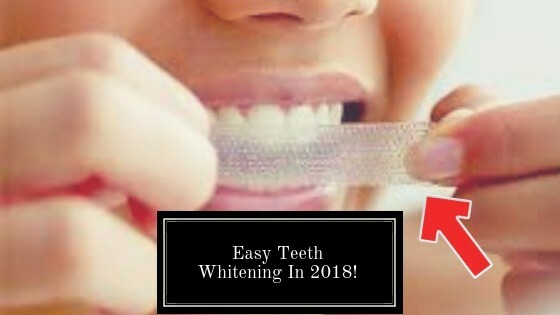 If you need fast results, this is what you need but keep in mind that some other whitening strips do just as good if not better over a longer period of time and at a fraction of the price! This is another budget tooth whitening kit which can give you a brighter whiter smile if you wish. They guarantee you will see results after using the treatment for 14 days. If you don’t you can get a refund. The sealed box contains 14 mini aluminium pouches, each locking up the freshness of 2 strips. You will also get a free shade guide so you can see your progress but please don’t give up on the strips after the first session, you will start seeing results in a few days. As the name suggests, the whitening strips are composed of 6% hydrogen peroxide so they won’t be too harsh on your tooth but it also means that you will not see a real change until you have used for 3-4 days. The key to making this a success is using it for 14 days straight. Clean your mouth carefully and clean the gel off your tooth. Store the strips in a cold place. Refrigerate but do not freeze the strips! They won’t break the bank either because their currently priced at $12.34. Give them a try and if you see no results you won’t feel too hard done by but if you do, don’t forget the 30-day money back guarantee they offer. Your actually in a win-win situation. 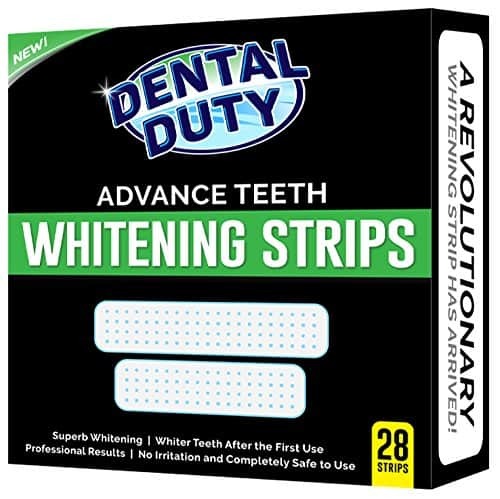 These whitening strips are different from the rest because of the new patent pending formulation of the natural ingredients contained within them. The creators of this product state that the natural ingredients: Coconut oil, Lemon peel oil and sage oil deliver high end results but don’t cause the sensitivity found with the more common whitening ingredients such as hydrogen or carbamide peroxide. It also contains dead sea salt which is packed full of vital nutrients such as: calcium, phosphate, manganese. Supposedly these are the first strips to be clinically tested on porcelain crowns, veneers and composite restorations. A study over at University of California’s Beckman Laser Institute evaluated the enamel whitening effects of Oral Essentials Whitening Strips and another leading brand’s whitening strip. 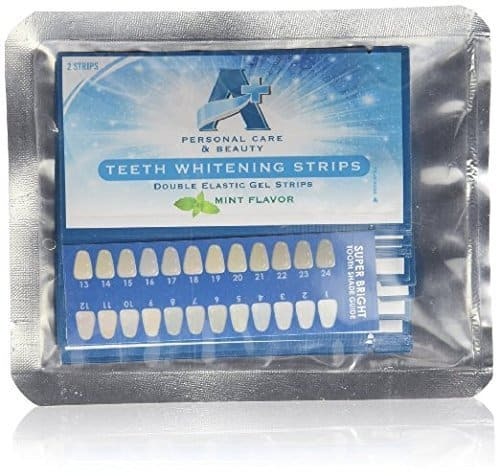 Overall, the whitening performance of the Oral Essentials whitening strip and leading brand whitening strips showed similar whitening effects, even though Oral Essentials did not contain peroxide. This treatment option comes with strips to last 14 days but the best part is they give you a bonus whitening mouthwash as well. Now that’s a lot of bang for your buck! If your a natural based health freak then Oral Essentials are for you because they only contain natural ingredients and won’t cause any sensitivity. These strips are also the first on the market to boast a non-toxic certification and have been clinically tested to prove efficacy. We have already had Crest on this list but this particular variation of it was necessary to include because of the high strength formula and the 4 star rating it has got from customers. It is true that Crest is the leading brand when it comes to tooth whitening and has a big market share and for good reason. Their products work and this particular product is no different. Hydrogen peroxide is the main active ingredient involved and is the most powerful when it comes to tooth whitening. You can be assured you will get results in a short period of time. Another thing that stands out is the 84 strips that have been included meaning there are enough treatments for 42 days! This is the reason why the price of this system is higher than everything else on this list at $63.99 but customer reviews are overwhelmingly positive and you should take that into account. Do not brush before using the strips, they will adhere better. Also, brushing before applying the strips will encourage extra gum sensitivity. Carefully fold the strip in half before removing from the plastic and squeeze gently at the bend but not too hard or you will squeeze out the whitener. This will provide a faint indicator crease to help you see where the centre is when applying them to your tooth. go find a seat, chill out, and watch a show for 30 minutes. Definitely don’t try talking as extra mouth movements can cause them to shift around. It says on the packet that you can apply these strips twice per day but to be honest, we think just one application per day will suffice. These strips are a no fuss, no BS straight to the point treatment that get the job done without being too complicated. Customers who have brought these are impressed by the quick results just after one use. The strips are double elastic making it easier to stretch over your tooth and best of all they come in a cool mint flavour. This will help mask the active ingredient hydrogen peroxide making them more pleasant to use. And like most of the whitening kits on this list, it comes with 14 days worth of treatments giving you enough time to see a real change. While these strips do give you results, many other competitors offer longer lasting results. Some customers also raised a concern about them being uncomfortable on their tooth. Maybe if your stains are not too severe and you need a light touch up, these could be for you. Whilst looking in the mirror, fit the lower strip making sure to apply sticky side gel against your tooth. Line up with the edge of the gum and apply gentle pressure to mould the strip securely to the tooth. Fold the remaining strip behind the tooth to keep it in place. After 15-30 minutes peel off the strip and dispose it. For best results, we advise you use this treatment for 14 consecutive days and try to avoid stain causing food such as curry, tea, coffee etc. Some reviews have said these strips work better than crest strips but the problem is they are so thin and don’t adhere too well. But considering the $10.97 price tag, its a real bargain and should be considered if on a budget. To the surprise of many of us, sheer white is actually a really good whitening kit considering it is relatively unknown in the market place. It’s an express tooth whitening treatment that gets the job done in 5 days. This is mainly due to the high concentration of carbamide peroxide, 20% to be exact!. Each film is made from mouldable material that conforms to all surfaces and contains a potent whitening gel for improved efficacy. Even while wearing these strips you can talk normally to your partner or friends and can even take a sip of water without worrying about any leakage or breakage. It’s got a good rating with over 80 reviews with the average being 4.2 out of 5 stars. They are good numbers for any product! Open the tray package and peel off 2 strips (gel facing up). Make sure your tooth are dry so the strips can attach easily. For best results please use them for 5 days straight and keep the strips refrigerated when not in use. The strips are actually quite large and many customers have said they find it easy to cover all of their tooth compared with what you get at your local grocery store. If white tooth are important to you, this is a good product. Just be aware that it takes time to see progress. 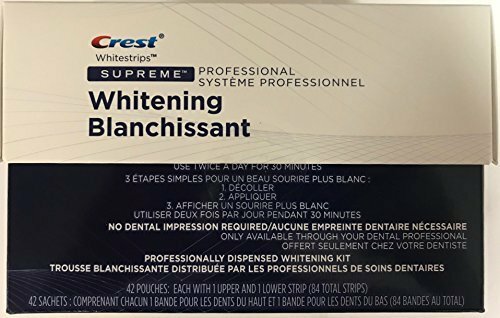 This is another budget option whitening strip that is worth a mention just because so many people have used it. It costs $9.99 which is the cheapest on this list and some might say that is good but more often than not the phrase: you get what you pay for rings true. It contains 6% hydrogen peroxide which is a safe level but not enough to give you the results you might want in a short period of time. The stand out features are the double elastic strips which makes it easier to cover all the areas of the tooth and the 100% enamel safe formula making sure your tooth sensitivity is kept to a minimum. You get the standard 14-day treatment and a free shade guide to help you keep track of your progress. We mentioned earlier about customer reviews and the average rating is 3.3 stars out of 5 which is pretty average to be honest but it still means more than 50% of people who brought it had good results with it. 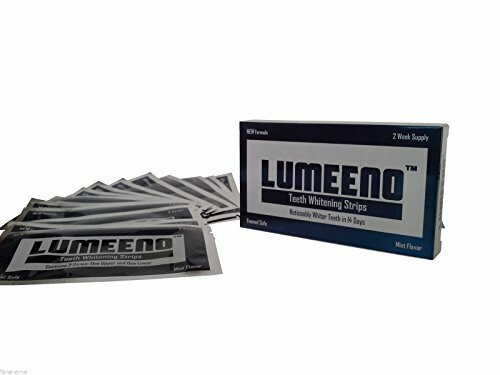 First of all, the application for these Lumeeno strips is not so easy. They slide a little too much so you have to make sure you wipe your tooth dry. Fit lower strip – apply gel side against your tooth and fold over the remainder to back of tooth. Dispose the strips after 30 minutes and rinse your mouth. Note: If you are not sure about your tooth sensitivity, keep your first sessions short. You can take a break if you experience sensitivity. Teeth sensitivity is a temporary condition and it goes away in 24 hours. Spend $10 or so and give it a try, we don’t think you will regret it!. We also want to mention if you have an event or special occasion and you want a white smile quick, try this! But there are other whitening kits on this list that are on the whole much better in terms of design and effectiveness. Phew!, that was a long list but at the end of it you should have picked out the whitening system you feel will best fit your needs and budget and its time to act and actually start using them. The more well-known brands such as Crest whitening are a safe bet and will get the job done sufficiently but they are on the higher end of the budget. There are some less known whitening strips that actually do just as good a job as Crest and cost a fraction of the price so bear that in mind. Read through the reviews customers have left and you should a good idea of which one will be best for your needs. But whatever you do please avoid Power Swabs Teeth Whitening system. It does not work! I’ve been waiting to find a good teeth whitening solution. 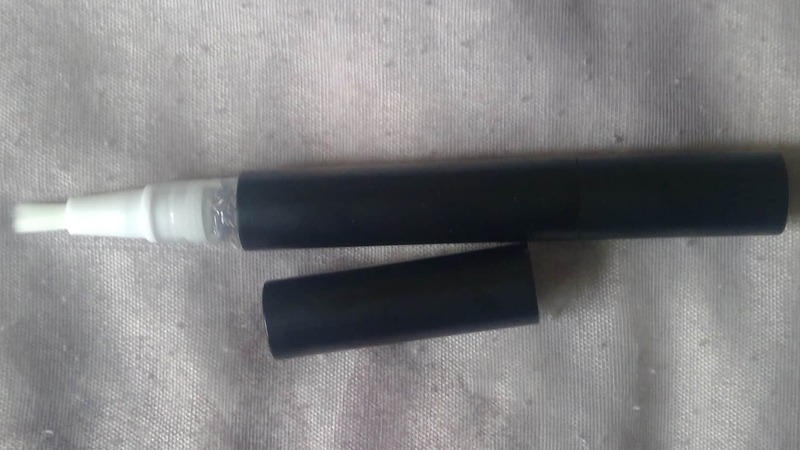 Theres so much out there to use, like charcoal for example, I’m currently using that right now and it works decently when you dont use it too often. I think I’ll go ahead and invest in some whitening strips, I want ultra white teeth. Charcoal teeth whitening powder was a big craze a couple of months back and yes it does work but can be quite messy at times. With whitening strips it’s a simple case of apply wait and remove. Be careful though because some low quality ones can be quite messy. Crest is a safe bet but all others mentioned on this list do a good job as well. It’s all about personal preference and how much money you have to spend. Good that you refer sharing your thoughts here with us. Let me say that safety is important in using any medication. I love the fact that the teeth whitening products you have reviewed all meet the standard in terms of the active ingredients. Teeth whitening is something that is essential especially to those whose the are trained or those with dental carries. I love ease of application with whatever products I’m choose not only in teeth whitening but other products for other uses. I’d love the Crest 3D for it’s ease of use and comfort.